Nosotros commands “Let’s do something!”. 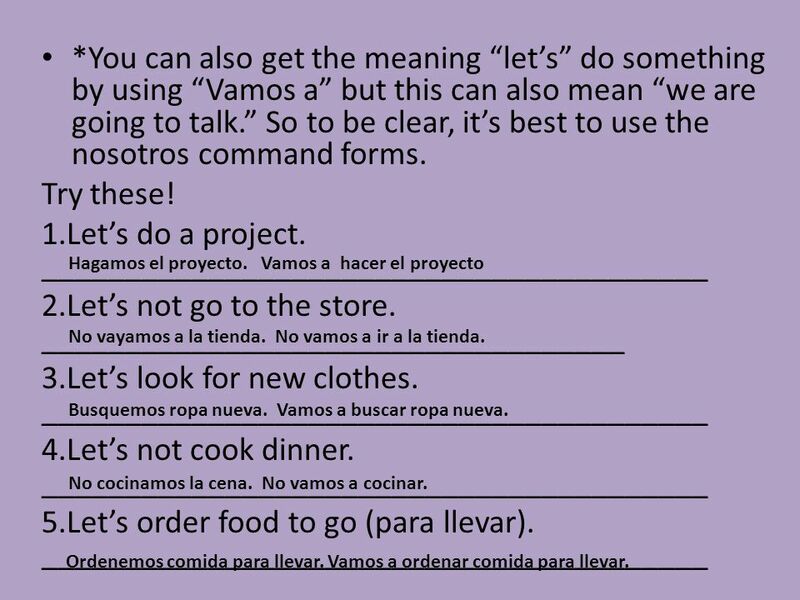 Nosotros Commands: “Let’s….” Nosotros commands express the idea of “let’s” do something. The speaker is included. 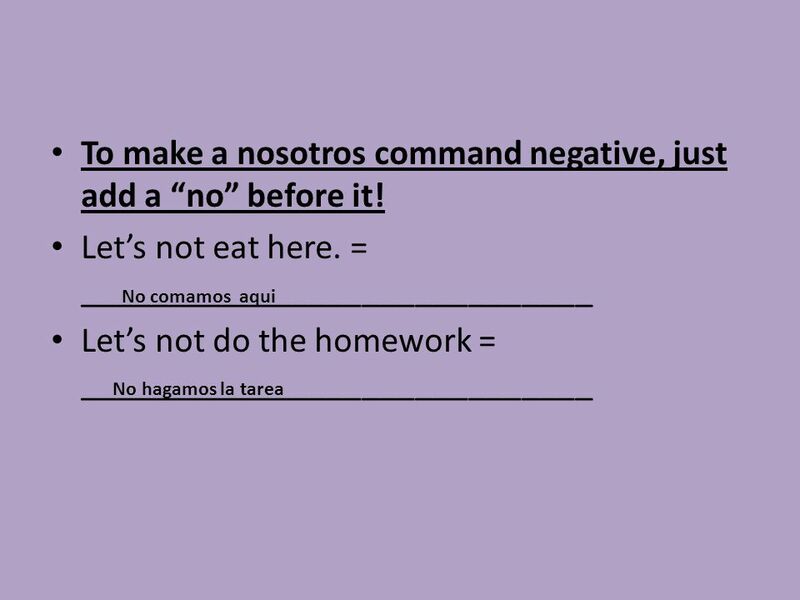 2 Nosotros Commands: “Let’s….” Nosotros commands express the idea of “let’s” do something. The speaker is included. 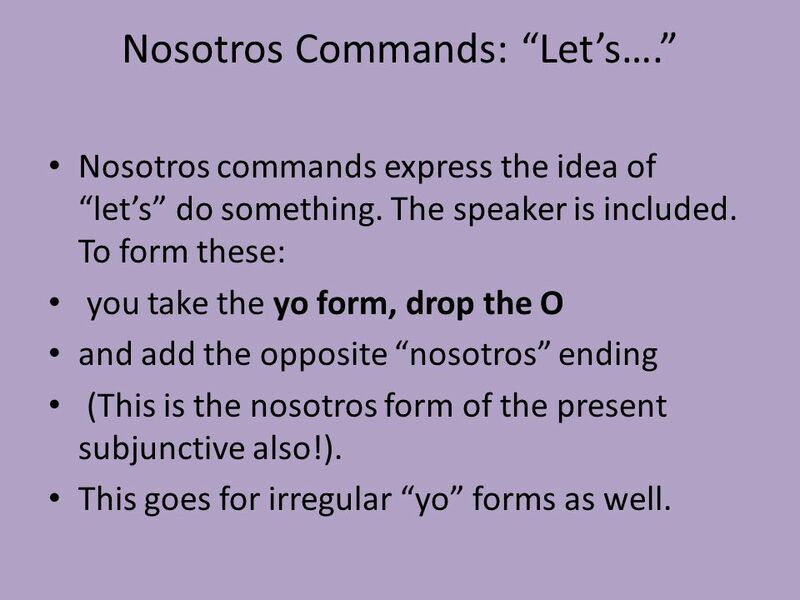 To form these: you take the yo form, drop the O and add the opposite “nosotros” ending (This is the nosotros form of the present subjunctive also!). 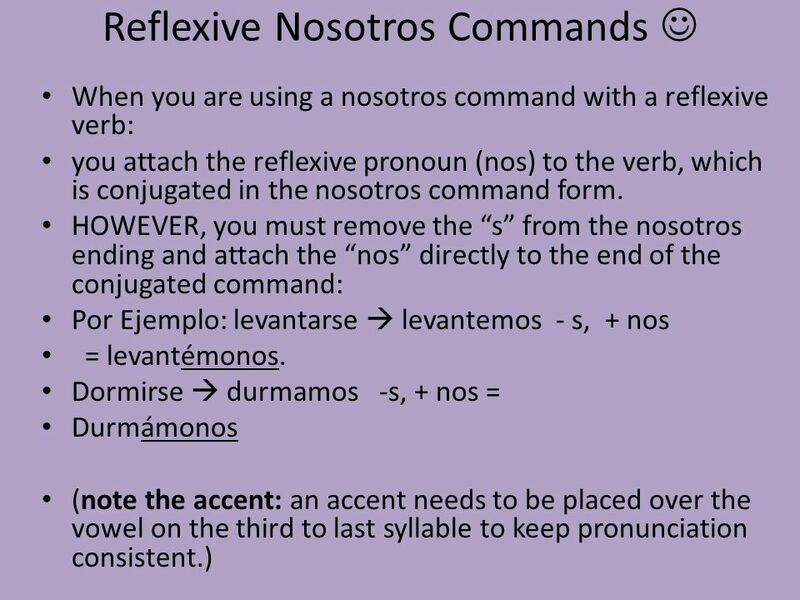 This goes for irregular “yo” forms as well. 3 Comer  como  comamos  Comamos aquí. = Let’s eat here. Compremos leche. 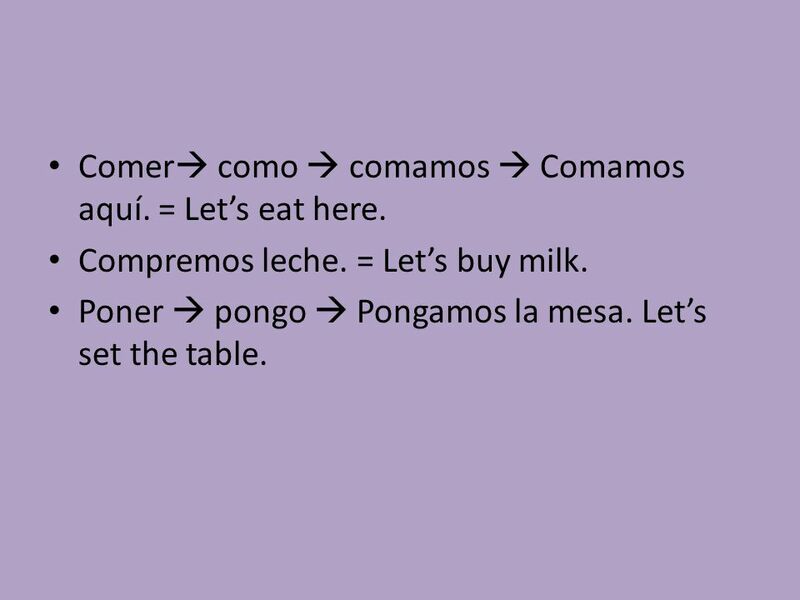 = Let’s buy milk. Poner  pongo  Pongamos la mesa. Let’s set the table. 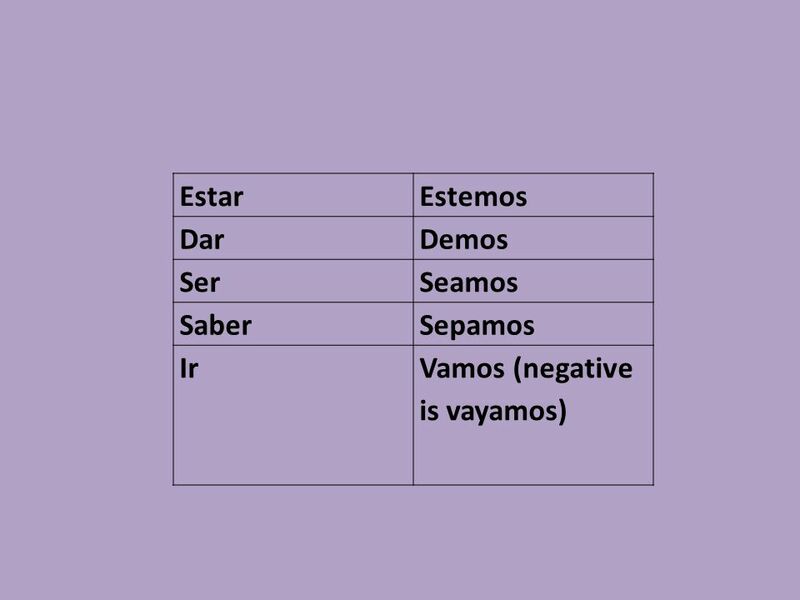 9 *You can also get the meaning “let’s” do something by using “Vamos a” but this can also mean “we are going to talk.” So to be clear, it’s best to use the nosotros command forms. Try these! 1.Let’s do a project. ________________________________________ 2.Let’s not go to the store. ___________________________________ 3.Let’s look for new clothes. ________________________________________ 4.Let’s not cook dinner. 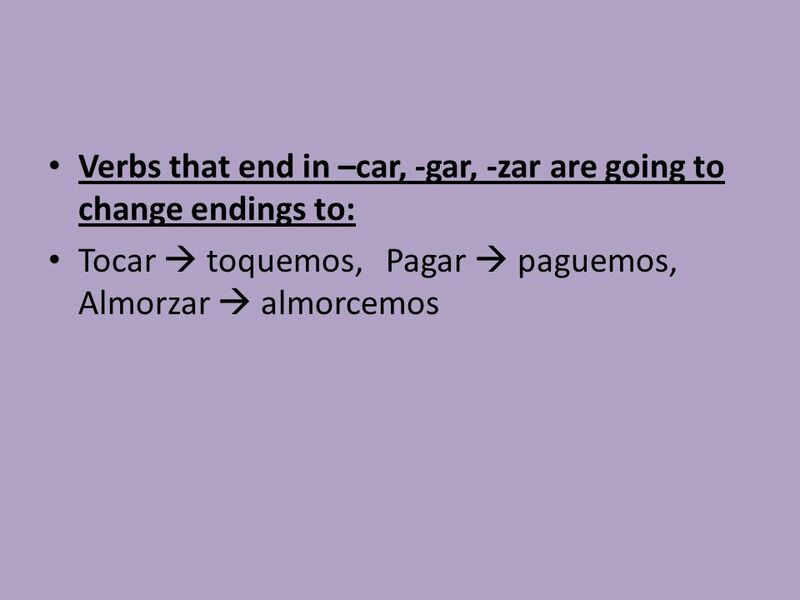 ________________________________________ 5.Let’s order food to go (para llevar). ________________________________________ Hagamos el proyecto. Vamos a hacer el proyecto No vayamos a la tienda. No vamos a ir a la tienda. Busquemos ropa nueva. Vamos a buscar ropa nueva. No cocinamos la cena. No vamos a cocinar. Ordenemos comida para llevar. Vamos a ordenar comida para llevar. 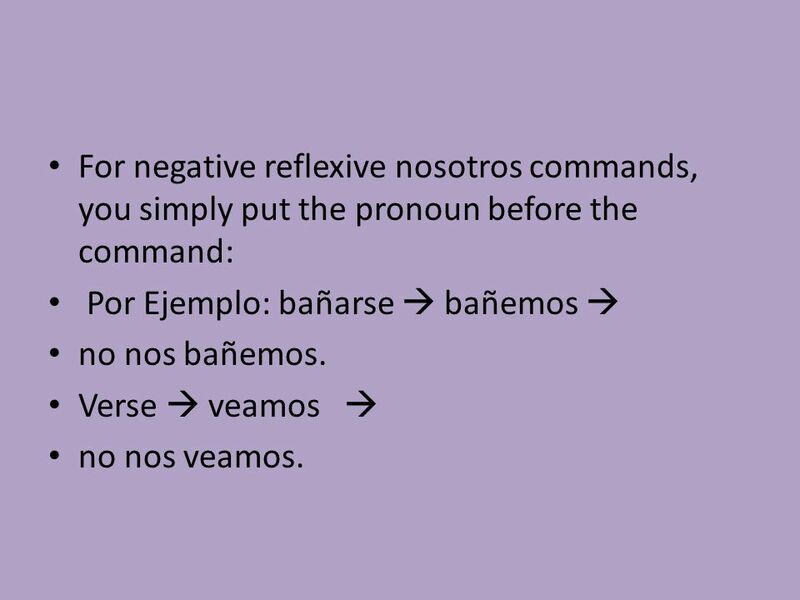 11 For negative reflexive nosotros commands, you simply put the pronoun before the command: Por Ejemplo: bañarse  bañemos  no nos bañemos. Verse  veamos  no nos veamos. 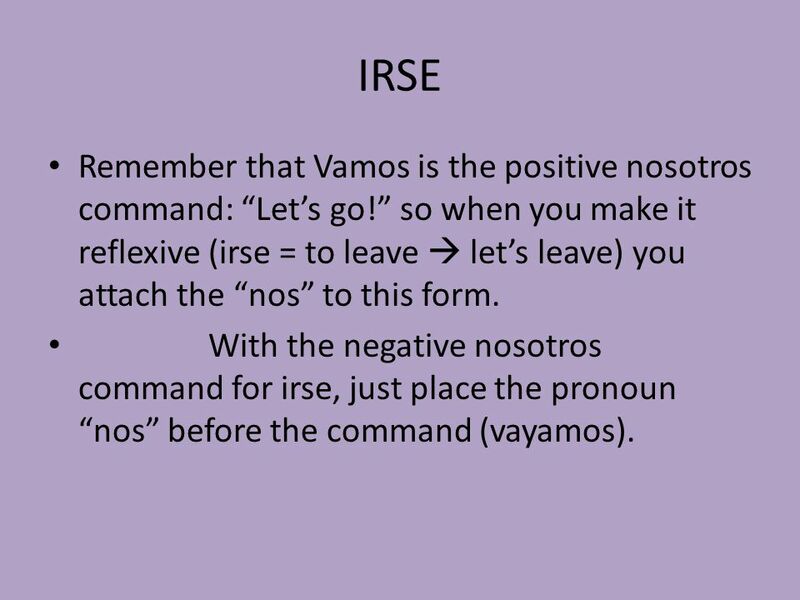 12 IRSE Remember that Vamos is the positive nosotros command: “Let’s go!” so when you make it reflexive (irse = to leave  let’s leave) you attach the “nos” to this form. 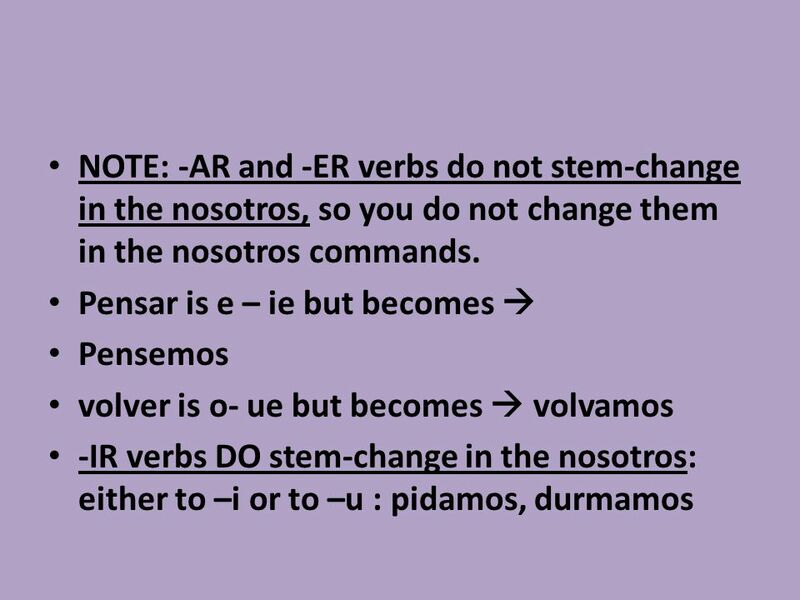 With the negative nosotros command for irse, just place the pronoun “nos” before the command (vayamos). 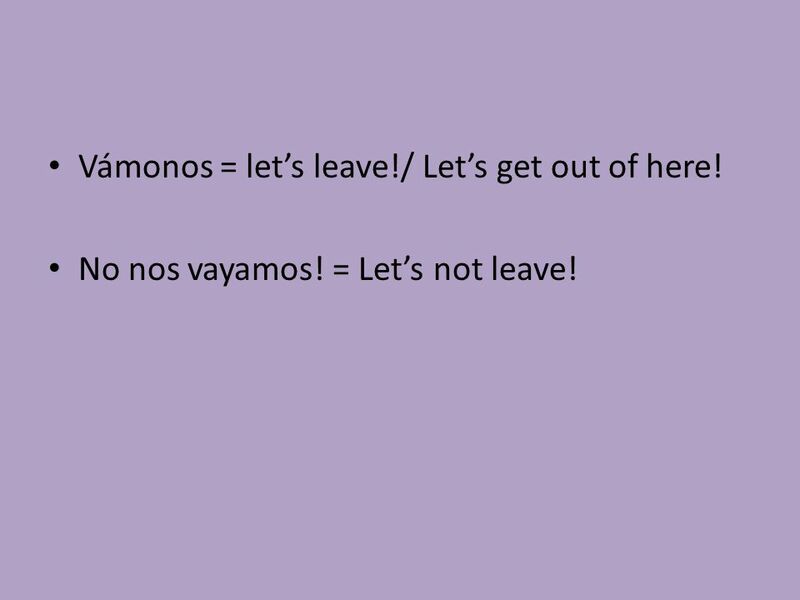 13 Vámonos = let’s leave!/ Let’s get out of here! No nos vayamos! = Let’s not leave! 14 Try these! 1. Let’s brush our teeth! _____________________________________ 2. Let’s wash our faces! ________________________________________ 3. Let’s go to bed early! ________________________________________ 4. Let’s have some fun. _______________________________________ Cepillémonos los dientes or Lavémonos los dientes Lavémonos la cara. Durmamos temprano. Divirtámonos. 15 5. Let’s love one another. ____________________________________________ 6. Let’s support each other. ____________________________________________ 7. Let’s not tell each other gossip. ___________________________________________ 8. Let’s not feel frustrated. ___________________________________________ 9. Let’s not sit down. __________________________________________ Amémonos. No hablemos del chisme. No digamos chisme No nos sintamos frustrados. Apoyémonos No nos sentemos. 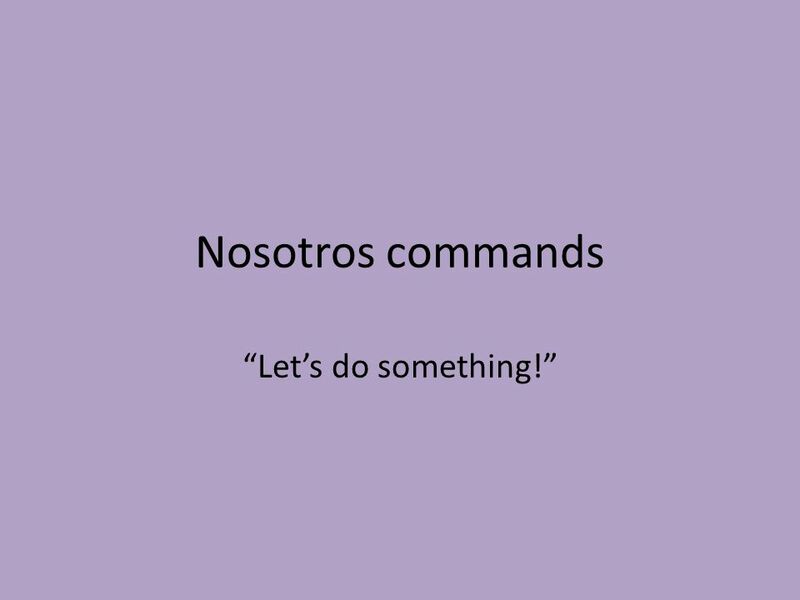 Download ppt "Nosotros commands “Let’s do something!”. 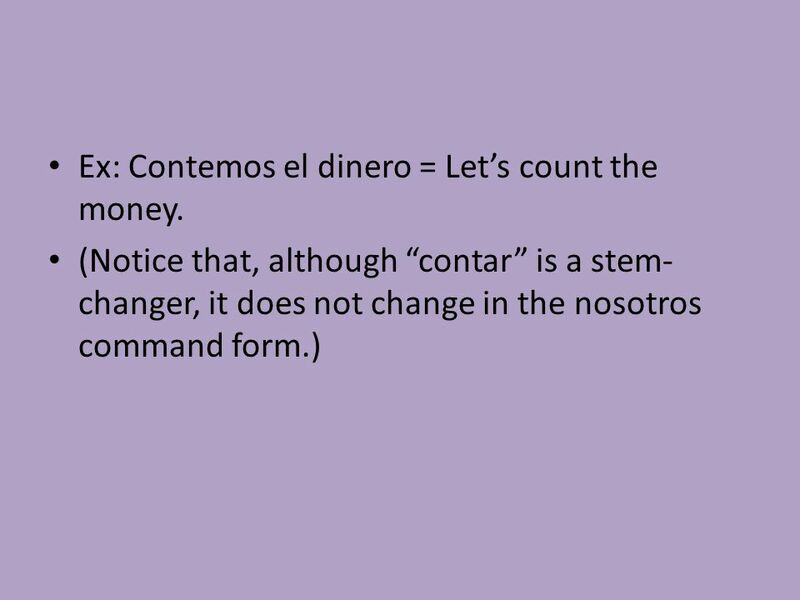 Nosotros Commands: “Let’s….” Nosotros commands express the idea of “let’s” do something. The speaker is included." Mandatos con Ud. y Uds. ¡Ven conmigo!, Level 2 Tp. 260. Commands: Formal Ud. and Uds. Nosotros commands “Let’s do something!”. 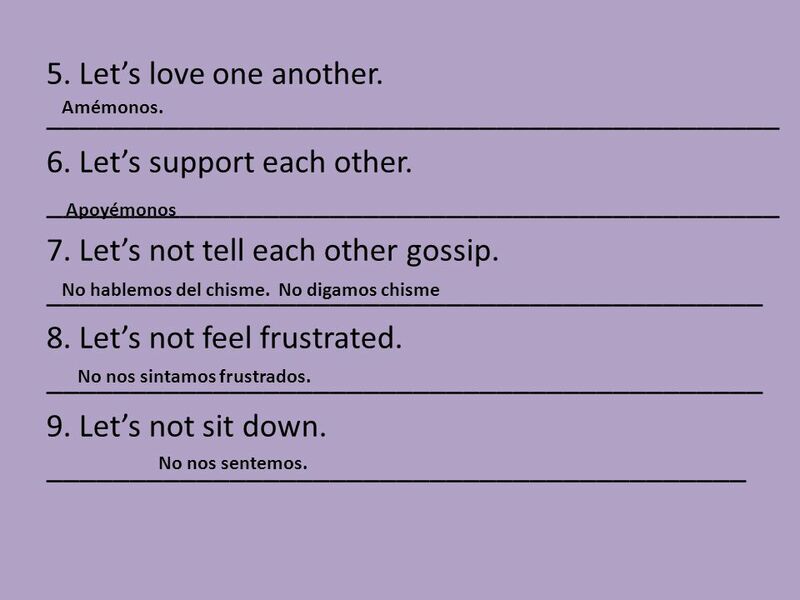 Using “Let’s” ©2010 Teacher’s Discovery “Nosotros/as” Commands By Jami Sipe.